WINSTON-SALEM, NC (Tuesday, August 28) - A night after the Salem Red Sox pulled off a sensational 10-inning victory, the shoe was on the other foot Tuesday night, as they fell 9-8 in 10 innings on a walk-off balk to the Winston-Salem Dash at BB&T Ballpark. The Red Sox (29-34, 61-70) saw their playoff hopes come to an end Tuesday night, with both their own loss and the win by the Lynchburg Hillcats sufficient to eliminate Salem. The Dash (39-23, 80-52) overcame a host of self-inflicted wounds in the win, having surrendered eight walks and six stolen bases and committed two errors. 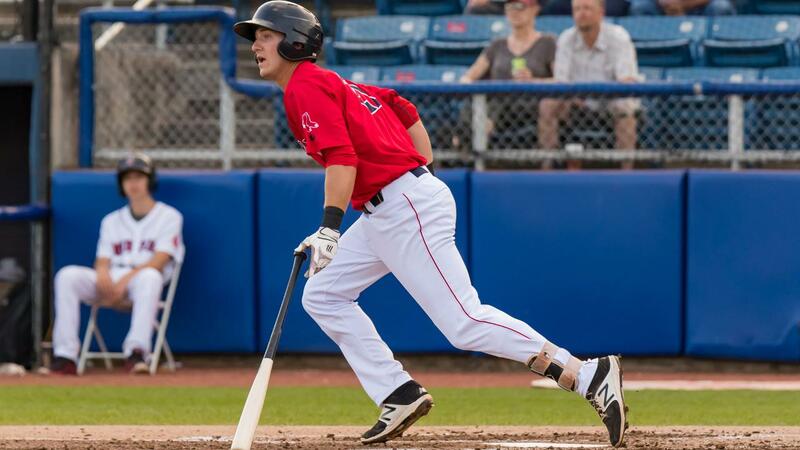 Michael Osinski hit a game-tying homer in the seventh inning for his first round-tripper at the High-A level. The Dash wasted little time getting on the board against Reyes, who allowed a one-out single to Luis Gonzalez before walking Nick Madrigal to put runners on first and second in the first inning. Blake Rutherford reached on a fielder's choice that saw Madrigal retired at second, leaving runners at the corners with two away. Yermin Mercedes flipped a soft single into left-center field, plating Gonzalez and giving the Dash a 1-0 lead. The Sox responded in the top of the second against Winston-Salem starter Alec Hansen (ND), who walked Osinski and Ryan Scott to open the inning. Victor Acosta bunted the runners to second and third, and Jagger Rusconi looped a two-run single to left to put the Sox in front 2-1. Salem added to the lead thanks to Hansen's wildness in the top of the third inning. The righty opened the inning by walking Brett Netzer, who stole second before Josh Tobias flew out to right. Osinski earned another walk, and the Red Sox pulled off a double steal to put runners at second and third. Scott popped out for the second out, but Hansen couldn't find the zone against Acosta, walking him to load the bases. Jagger Rusconi worked a bases-loaded base on balls, plating Netzer and extending the advantage to 3-1. In the fourth inning, Salem tacked on another two runs against Dash reliever Mike Morrison (), who walked Nick Sciortino to start his time on the mound. Tyler Hill singled to center, and Netzer grounded to first, advancing the runners to second and third. Josh Tobias flicked a soft liner into center field, scoring the runners and making it 5-1 in favor of the Sox. Things fell apart for Reyes in the bottom of the fifth inning. He retired the first two batters, but Madrigal singled, and Rutherford doubled him to third. Mercedes hit a grounder to third that Tobias fielded cleanly, but his throw to first skipped in the dirt and proved too tough to handle for Osinski at first base; the error plated Madrigal and allowed Rutherford to reach third on the play. Gavin Sheets hammered a double to center to score both runners, and Laz Rivera mashed a two-run homer over the wall in left to give the Dash a 6-5 lead. Salem drew level again in the top of the seventh. With one out, Osinski jumped on a slider from Morrison and sent it soaring over the left-field fence for a solo homer. It was Osinski's first big fly for the Sox, and it knotted things up at 6-6. That tie was short-lived, though; Rivera singled home Mercedes in the bottom of the seventh inning against Sox reliever Yankory Pimentel to put the Dash back in front 7-6. In the ninth inning, the Sox shocked Dash closer Tyler Johnson (BS, 1; W, 4-0). Tobias led off with a single to center, and Ryan Scott flipped a one-out single into left. Tobias slid in safely at third, with Scott advancing to second on the throw. Acosta hit a bouncer to short, and Tobias sped home just ahead of the throw from Rivera to tie the game at 7-7. Reliever Austin Glorius (L, 1-1) set down the side in order in the bottom of the inning, sending the game to extra frames. With one out in the top of the 10th, Hill singled home Nick Lovullo, who had started the inning at second base. However, the Sox couldn't hold the lead in the bottom of the inning. Glorius fanned Ti'Quan Forbes, but Luis Robert dropped an RBI single into right-center, and Gonzalez singled to put runners at first and third. With Madrigal at the plate, Glorius stumbled during the delivery of a pitch, and was called for the walk-off balk. Reyes matched a career-high with six runs allowed, though only one was earned; he gave up eight hits and two walks while fanning one in 4.2 innings. Pimentel surrendered a run on five hits and struck out two in 2.1 innings. Durbin Feltman allowed two hits in a scoreless inning of relief. Glorius gave up two runs (one earned) on two hits and recorded two strikeouts in 1.1 innings. The Sox will try to rebound Wednesday night, with righty Kutter Crawford making the start for Salem against Winston-Salem southpaw John Parke. First pitch from BB&T Ballpark is scheduled for 7:00 p.m., and the pregame show with Ben Gellman and Suzie Cool begins at 6:45 p.m. on the Red Sox broadcast network.